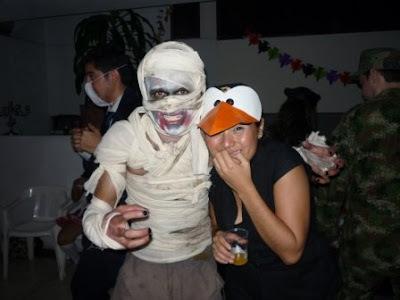 On Halloween 2009 I found myself in Cali, Colombia. Stefy, my wonderful host, had organised that we attend the Couchsurfing Halloween party... where a costume was obligatory. I had never dressed up for Halloween before - except for that one time when I was about 14-years-old when I dressed-up in a bed sheet and called it a "toga." Even I thought that was lame. 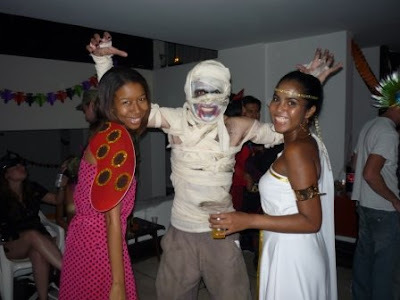 Strangely, the idea of dressing up as a mummy came to me in a dream. So I went and bought 3 meters of cheap cloth; tore it up into strips; painted my face (n.b. lots of fun) and wrapped myself up. This was the result. Most people were quite impressed. Actually, I was surprised that it turned out the way that I had imagined it. However the horror and scary connotations of Halloween do not really apply here. The women mostly dressed up glamorously; perhaps with wigs or a traditional dress, but definitely nothing ghoulish or evil. The men did had costumes - e.g. rock-stars, doctors, and more wigs - but on the whole, Halloween in Colombia was more like a fancy-dress party. I guess I now know what I'll look like if I ever enter a state of un-dead. Yes, it was a really fun night.